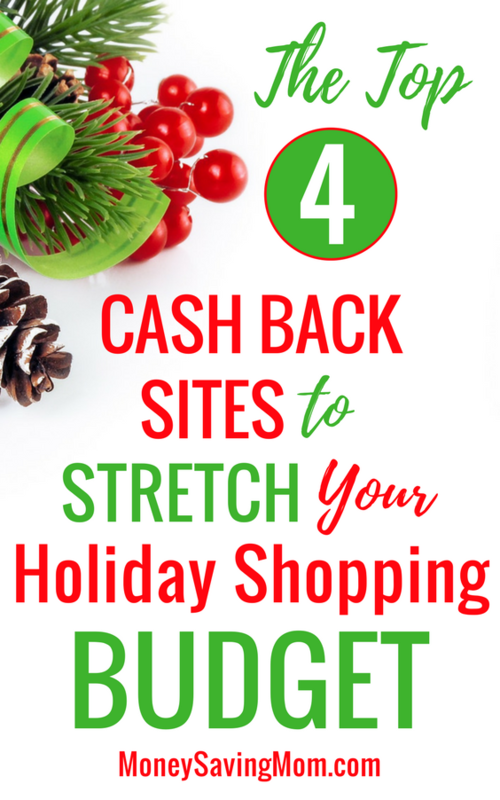 Stretch your holiday shopping budget with online cash back sites! Christmas is right around the corner! If you’re shopping for last minute gifts online, don’t forget how useful cash back sites can be in stretching your holiday budget just a little bit further! Cash back sites work with online retailers to offer you a percentage–usually somewhere between 3-10% of your total purchase–back as a rebate. While 3-6% might not seem like much, it can really add up over time. And if you’re already going to be making the online purchase, you might as well get a little kickback, too, right? After all, it’s essentially “free” money! One of the oldest cash back sites, has an easy-to-navigate website and, in my personal view, is the best cashback program. You only have to earn $5.01 in rebates in order to get a check or Paypal payment. You and make at least $25 worth of purchases within the first 90 days, so you’ll reach your first payout very quickly! is another site I’ve used for quite a while. I really like them, because they offer cash back at over 4,000 stores, have guaranteed highest cash back rates, and are really customer-friendly. If you find a higher cash back rate anywhere else, they will match it for you. They also allow you to receive a payout at any time (no minimum required!) and offer five different payout options. Earlier this year, I discovered — a new cash back site that offers cash back at over 5,000 online stores, including Walmart, Target, Amazon, Best Buy, and more! One of the greatest features of is that they offer guarantees on their cash back rates and will match a rate by 125% if you find it higher anywhere else online. You can request a payout once you’ve accumulated $25 in cash back, and you’ll then receive it within 10 days. They also offer a and earn $10 in cash back within the first year. If you’ve read my blog at all, you know I’m a HUGE fan of . And you probably signed up a long time ago and have been earning gift cards ever since. But did you know that you can earn swag bucks on many of your online purchases in the form of cash back? Make sure you’re each day when you shop online, and then activate the Swagbucks cash back button when it pops up! This one is a little bit different than your typical cash back site, since your earnings are in the form of swag bucks. But it adds up quickly over time, and you can trade those earned swag bucks into gift cards! How to Fund Your Christmas Budget — In Just 15 Minutes per Day! Am I missing any of your favorite cash back sites? I’d love to hear! I use both ebates and upromise.com. While set up to be a college saving site (you can choose to have your earnings deposited directly into a college savings account), you can also choose just to get the cash. I find– by checking evreward.com, which lists the current cashback/points percentages of a lot, though not all, of these sites– that upromise often has a higher percentage offer than ebates. Can you sign up for multiple cash back sites? I currently do ebates and had a great experience! Can I do topcashback and befrugal too? There’s a site called Cashbackholic that compares rebates between multiple rebate sites. I’ve also had good luck with MrRebates. I really like Pinecone Research. This past month they have sent me 3 products to test and I am earning Amazon gift cards with them also. Ebates cash, InboxDollars, MySurvey, Swagbucks paid for gc to bless my foster kids gifts for my co-workers, daycare, mailman, paperboy and waste disposal guys. Crystal regularly shares survey opportunities – Jump on in !